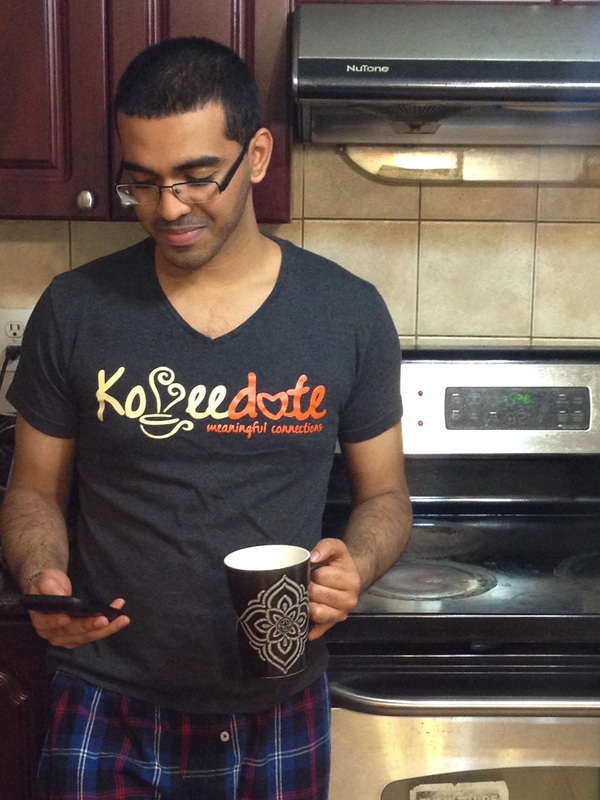 Thanusan Chelvarajah is a dedicated, imminent entrepreneur, and the mastermind behind Koffeedate, a mobile dating application that caters to the South Asian community. Although a newcomer to tech start-ups, the extensive market research conducted over an entire summer by Thanusan and his team, which include a marketing genius and a software development engineer, is comprehensive and calculated. They conducted in-depth interviews with over a hundred individuals, predominantly women, about dating and the arranged marriage process still prevalent among south asians. Several common responses from participants during these interviews were used to develop the prototype. Additionally, external thinkers and industry professionals were consulted to provide supplementary support. “Some of the questions in the app were derived by collaborating with an expert relations advisor here in Toronto named Yvonne Sinniah,” Thanusan clarified. In his leisure, he delved into the user experience by working existing dating applications to explore difficulties that plagued consumers. With qualitative data confirming a necessary transformation in cultural mentality regarding romantic relationships, the Koffeedate team was well-equipped to design and build the prototype. Born and raised in Silver Springs, a rich and vibrant south Asian community in Scarborough, Thanusan remained a modest and shy adolescent throughout his high school and university years. After graduating and attaining a position at a mid-sized asset management firm as an accountant, with the hopes of moving up the corporate ladder, he set out to familiarise himself with a circle of like-minded people. At networking events, he met a plethora of self-driven entrepreneurs creating and expanding their endeavours. He explained with enthusiasm, “I spoke to other entrepreneurs about how to go about starting from scratch, and many technical experts about how to go about building an app.” The inception of Koffeedate could be traced back to this single moment. Positively impacted by networking, Koffeedate was given the chance to pitch in front of four industry professionals for a million dollars on the show Launchpad, adding another success for the start-up. Koffeedate was given an opportunity to win over the audiences’ votes to qualify for the finals. Koffeedate is scheduled to launch early 2016 and will extend to its consumers the chance to become beta testers, reviewing and providing honest feedback which will be used to refine the application effectively. To keep consumers continuously supported, relations advisor facilitated workshops that openly discuss online security and literacy will forego the fear associated with online dating applications in the south asian niche. Although Thanusan’s intention is to detangle a meaningful romantic relationship, his relatable and transparent journey allows the premise to be shared among those who want to keep their cultural traditions, but provide those meandering the chance to accomplish similar outcomes through different means. The views expressed here are solely those of the author and do not in any way represent the views of Canadian Tamil Youth Alliance. This entry was posted on Thursday, December 3rd, 2015 at 4:42 pm	and is filed under Cafe, News, Speak Out, Uncategorized. You can follow any responses to this entry through the RSS 2.0 feed. You can leave a response, or trackback from your own site.